Established in 1972, The Mission Bay Marlin Club (MBMC) is one of the oldest existing saltwater fishing clubs in the San Diego region and has traditionally been the club of choice for many of the best anglers on the Southern California coast. MBMC is dedicated to promoting the joys of fishing, encouraging sportsmanship and fellowship among its members, and conserving our local fishery. The club hosts a range of fishing tournaments and social events each year. Whether it be bay, bottom, in-shore or off-shore fishing; there is some type of fishing fun for everyone. Since 1975, MBMC has proudly hosted the Charity Heart Marlin Tournament, an annual fundraising effort. We invite new members – male, female and juniors, to participate and get the most out of the MBMC experience. See Membership for more info. Welcome to Mission Bay Marlin Club’s new website and the 2019 fishing season. Browse around the website to see what MBMC has to offer. 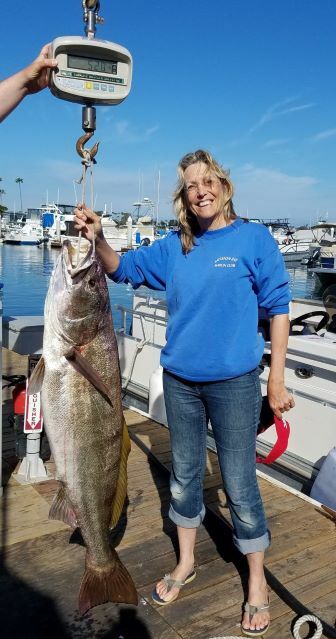 Congratulations to Trish Carlin on catching a whopping 52 lb White seabass!